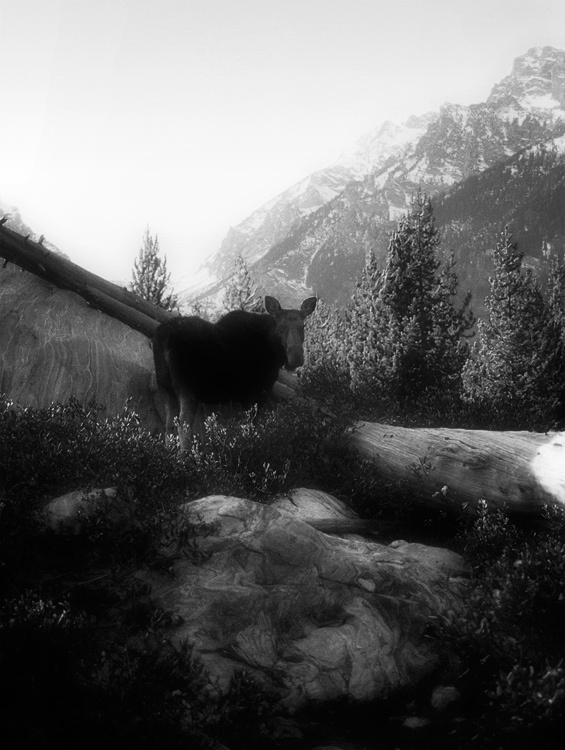 A Moose stubbornly blocking the trail in Grand Tetons National Park, WY. I forgot I had a 4 year expired color slide film in the K1000 and thought it was a B&W roll, monochrome conversion done PP in Photoshop. What a sight! They're such a unique creature. Love how the processing turned out on this – gave it a very old look – like early B&W postcards from out west. Works well centered. Lots of interesting layers in this image. wonderful capture and a fabulous thing to happen upon. Not the prettiest animal in North America but you shot is. Cool shot! Great catch! Love the b&w treatment! Great shot. I haven't seen a moose in a long time and I guess this will have to do for a while.